Imo State Governor, Rochas Okorocha has stated that the Adams Oshiomole-backed APC candidate in the state, Senator Hope Uzodinma “is desperate” to become governor to avoid facing trials for the *corruption" case that led to his arrest at Abuja Airport. Uzodinma, who represents Imo West Senatorial District in the Senate, was arrested on Sunday by the Special Presidential Investigation Panel For Recovery of Public Property for the failure of his company to execute a contract of $12m for the dredging of Calabar channel. The lawmaker, who emerged as the APC governorship candidate in Imo State under controversial circumstances, has since denied that he was arrested, even after the head of the team who arrested him confirmed that he was arrested. 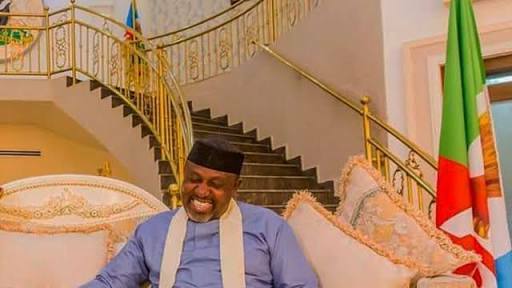 Okorocha, who is currently battling to stop Uzodinma from the governorship race in favour of his son-in-law, Uche Nwosu, said on Tuesday that the senator was aiming to enjoy immunity as a governor to avoid trial. The governor again attacked the APC National Chairman Adams Oshiomhole for his insistence on Uzodinma as the governorship candidate of the party in Imo State. “Chief Uzodinma is desperate to govern Imo State through the assistance of men like Adams Oshiomhole to evade the criminal trials he is already facing,” Okorocha was quoated as saying in a statement by his Chief Press Secretary Sam Onwuemeodo on Tuesday. Meanwhile, Nwosu, on Tuesday vowed to stop Uzodinma from succeeding his father-in-law next year. and the constitution of our party by substituting my name for Hope Uzodinma. “The records are very clear. I won the first primary election on October 2. I also won the second primary held on October 6.The records are there. The police,INEC and DSS reports affirmed my victories.